Over the weekend, I was in a food mood and I just couldn’t shake the desire to make ice cream (among other things). 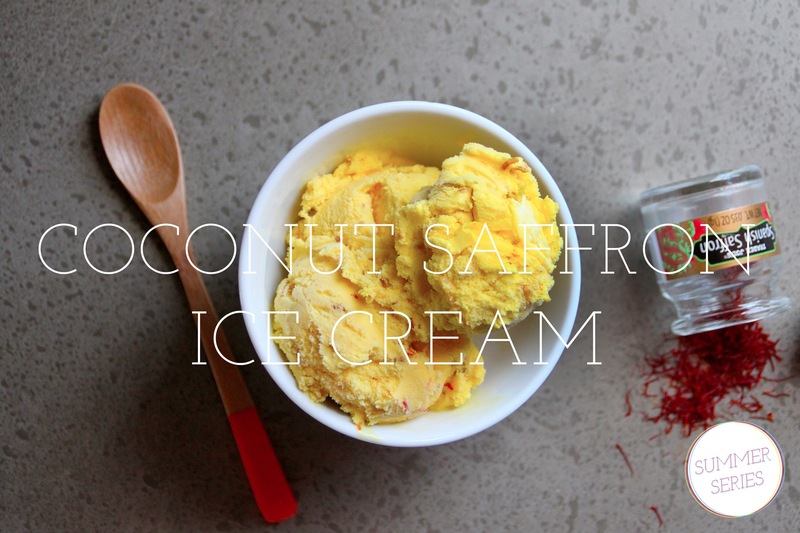 This Coconut Saffron Ice Cream, a David Lebovitz adaptation, has been on my radar for quite some time and I just happened to have all of the ingredients on hand. Having only used saffron in rice dishes and, for the most part, only eaten coconut in some form of dessert, I was pretty intrigued by the juxtaposition of the two spectrum-spanning foods. Saffron, with its distinct taste and smell (and color), clearly takes center stage in this recipe, while coconut milk adds a sweet creamy balance. Together, this unusual combination, makes for a deliciously sophisticated flavor. Fair warning, this ice cream is not for everyone, but I do highly recommend it to those of you with more adventurous palates. It’s really quite good. Recipe below. xoxo! 1. In a medium-sized saucepan, bring all the ingredients to a boil except toasted coconut. 3. Once chilled, freeze in your ice cream maker according to the manufacturer’s directions. Add toasted coconut at this point. 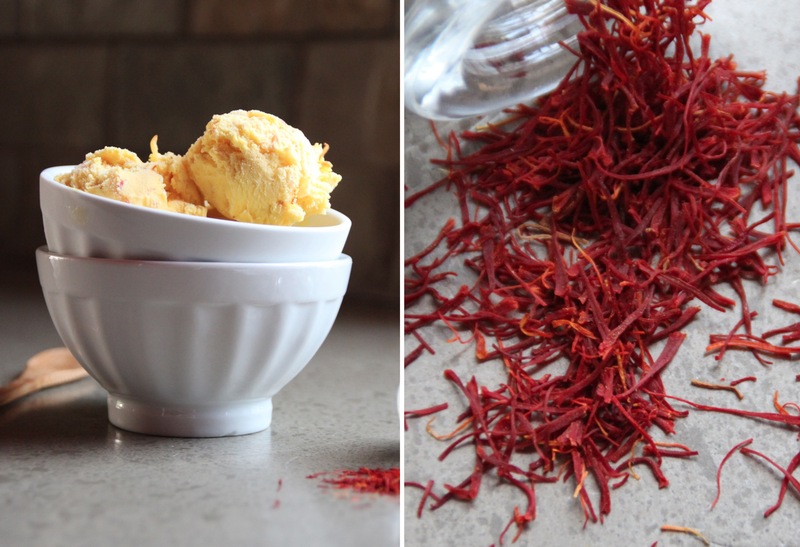 Once churned, be sure to scrape any saffron threads clinging to the sides back in to the ice cream. Note: if you don’t have an ice cream maker, David Lebovitz has an awesome post on making ice cream without one, here. I bet this would be delicious with some fresh raspberries! Mmmm! That sounds so refreshing! Seems quite easy and has no egg yolks which makes it “lighter” in a way. It was super easy! I love no yolk recipes. You don’t need an ice cream maker! There’s a link to a no ice cream maker method of making ice cream at the bottom of my post! Yay! whether I ever try any of your intriguing recipes or not, I enjoy your writing and descriptions: eg–intrigued by the juxtaposition of the two-spectrum spanning foods”–saffron and coconut–who would have thought? Yum! This looks amazing. I’m going to try and make it but with only coconut milk since I can’t eat dairy. Probably won’t be as rich and creamy, but hopefully still delicious. Coconut milk alone sounds tasty, it’ll probably be more icy like a snow cone…but who doesn’t love a snow cone?! !….your blueberry coconut ice cream looks amazing, btw. I can’t wait to try it! wow what a combo. i would never think to put all of this together but it sounds amazing. thanks for postinG! Seeing your recipe makes me realize that the possabilities are endless when it comes to summer ice-creams, pops, sno-cones and other refreshing treats! thank you!! For eesh – you probably could substitute an almond or rice milk – they are thinner, of course, but will add more creaminess than nothing other than the cocoanut milk….. Have fun eating the trial and errors!